A Pre-Opener is typically the first opening machine fiber passes through after leaving the balefeeds. The purpose of the Pre-Opener is twofold. 1. It begins the mixing process. 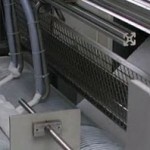 Often fiber coming from the fiber conveyor, located under the exit end of the balefeeds, is composed of dissimilar fibers. 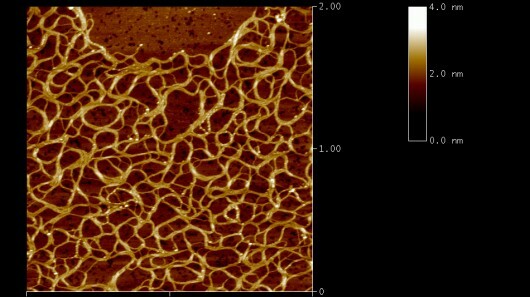 These fibers may even be different colors. 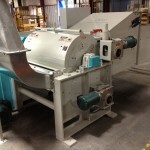 The fiber is dropped in layers by the balefeeds as the fiber conveyor indexes past the balefeeds. The Pre-Opener chops through this “sandwich” of fibers and does a fair job of mixing the fibers. 2. The Pre-Opener begins the process of opening the large tufts of fiber coming from the balefeeds. The machine following the Pre-Opener is usually some type of Fine Opener. The Fine Opener could not perform its intended purpose if the Pre-Opener was not there to start the opening process. 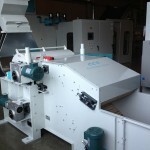 Pre-Openers can be stand alone machines or they may be attached to the fiber conveyor. Depending on the characteristics of the fiber to be opened, the cylinder of the Pre-Opener may be covered with spikes or coarse wire. The Pre-Opener is doffed by a suction fan. One of the web forming methods in nonwovens is called dry laid. 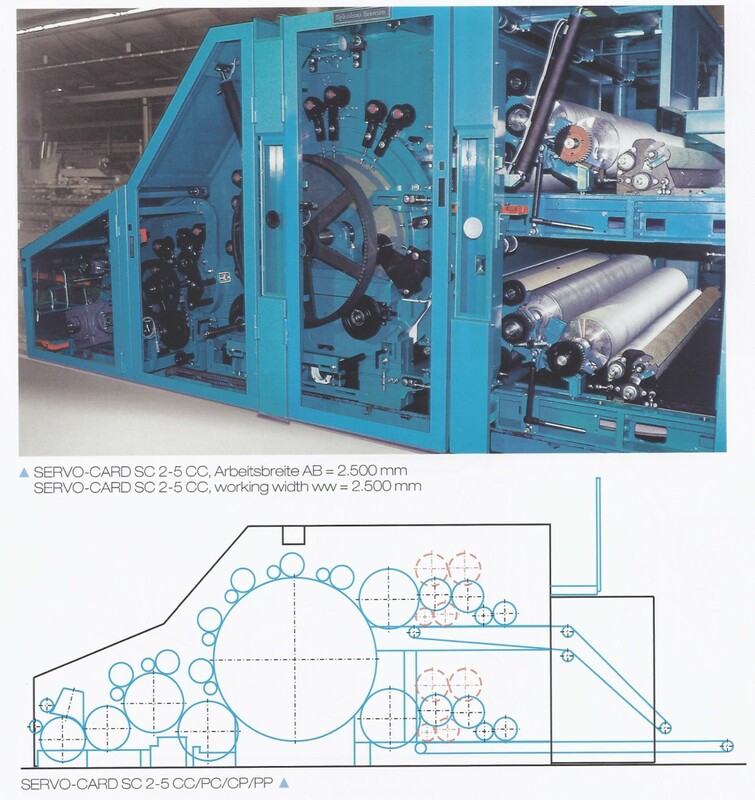 The primary machine used to form a web in the dry laid process is a roller top card. 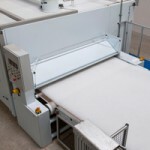 The primary purpose of a card is to open tufts of fiber presented to it from a fiber feeding system that is usually comprised of several open-ing hoppers, a blending reserve, a fine opener, and a chute feeding the card. The card has many rolls in it that are covered with metallic teeth. These teeth convey and open the fibers as the rolls turn. Especially important in a roller top card is the interaction of the worker and stripper rolls with the main cylinder. The majority of carding of the fibers takes place between the workers and strippers. There are usually 3 or more sets of workers and strippers around the main cylinder. The main cylinder carries the fibers through the card. When the fibers exit the card, they have been combed by the card so that the fibers are parallel. The card also blends fibers as they are processed. Depending on the end use of a nonwoven fabric, it may be advantageous or detrimental for the fabric to be able to absorb water. There are two terms used to describe a fiber or fabric’s propensity to absorb or repel water. 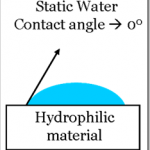 Those terms are hydrophilic and hydrophobic. “Hydro” is a Greek word meaning water. “Philic” means loving and “phobic” means hating. 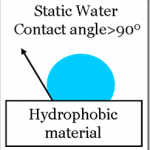 Thus hydrophilic means water-loving and hydrophobic means water-hating. With respect to fibers, natural fibers tend to be hydrophilic, especially when natural oils have been removed from them. 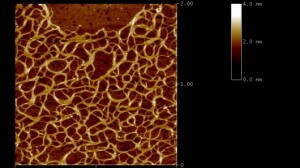 Thermoplastic fibers tend to be hydrophobic unless they are treated with chemicals to make them hydrophilic. 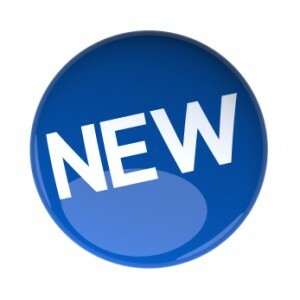 Things are a little different with nonwoven fabric depending on the thickness of the fabric and how the fabric is made. Thin fabric tends to behave like the fibers from which it is made. Thick fabric such a needlepunch can absorb water even if it is made from fibers that do not naturally absorb because the water can migrate by capillary action into spaces within the fabric. Mechanical methods such as pushing the fabric under the water or squeezing the fabric under water can have an effect as opposed to just lying the fabric on the surface of the water. Chemicals such as surfactants, wetting agents, and rewetting agents can make a fabric that is naturally hydrophobic into one that is hydrophilic. 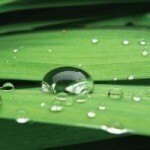 There are also chemicals that can make hydrophilic fabric hydrophobic. The leaves of the lotus blossom are naturally hydrophobic. Water just beads up. Nonwoven fabric is often used for air filters. To determine how to construct the fabric to per-form as desired, we need a way to measure the flow of air through the fabric. The measurement of air flow through a fabric is call its air permeability. Sometimes nonwoven fabrics that are used for purposes other than air filters have an air permeability specification. This is because air permeability is also a measurement of how much open space between fibers is in a fabric. Thus it can measure effects of calendering, coatings, tightness of needling, fiber denier changes, etc. Air permeability is usually measured in cubic centimeters per minute or cubic feet per minute. The standard method for conducting an air permeability test is ASTM D737 which is a standard published by ASTM International. 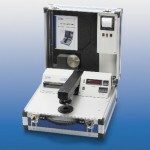 There are several types of testing machines that can measure air permeability. The original was developed by the National Bureau of Standards in the 1940’s. It works by measuring the difference in pressure on both sides of a fabric. 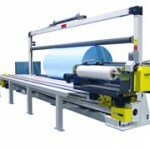 That same type of machine is still being sold today and is commonly found in nonwoven plants. 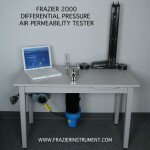 It is called The Frazier® Differential Pressure Air Permeability Measuring Instrument. 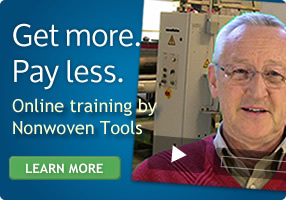 Making a good roll of fabric on a nonwoven production line is not the end result of a customer’s order. The customer will not be satisfied until the roll arrives at their location in good condition. For that reason, nonwoven manufacturers often use some type of stretch wrap to protect their rolls. Many apply the stretch wrap with a machine called a roll wrapper. There are several types of machines from manual to fully automatic. Some are built at the end of production lines and others are off-line. The type and location depends on the length and diameter of the rolls. Stretch wrap is a strong plastic film that can be stretched up to 500% in length before it breaks. Many wrapping machines prestretch the film from 100% to 300% before it is applied to the roll. This is done for economy, to get the most feet of wrap from a roll of stretch film. The plastic polymer used in stretch film also gets stronger up to a point when it is stretched. The stretch film is wound tightly on the roll of fabric and the surface of the film has an affinity for itself. In other words, the film tends to stick to itself. This helps to make a very neat, tight package. Stretch film is usually clear or black. The black film helps protect rolls that would be affected adversely by sunlight. There are primarily two methods of making webs from staple fiber: carding and airlaid. Where a card makes a thin web of parallelized fibers, an airlaid machine can make a significantly thicker web in which the fibers are quite randomized in orientation. On an airlaid machine a lightweight web might be 50 gsm and 6 mm thick and a heavy web might be over 3000gsm and 150 mm thick. Of course output speed of the machine is much slower at the heavy weights. 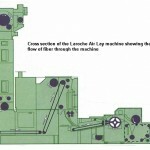 On the input end of an airlaid machine there is a feedroll and feedplate feeding fiber to a high speed lickerin. The fibers are then knocked off the lickerin by a high speed stream of air. 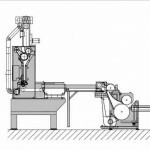 The fibers are carried by this air stream and deposited on either a moving conveyor that is made of fine, porous mesh or onto a rotating porous condensing drum. Inside the drum or conveyor is a vacuum that is slightly stronger that the air stream carrying the fibers. 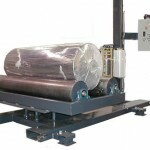 Thus the fibers are pulled onto the drum or conveyor and held fast until the drum or conveyor moves forward to a spot where there is no longer any vacuum. 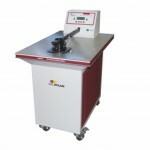 The formed web is then conveyed to the next element of the nonwoven line, which is usually some type of bonder. 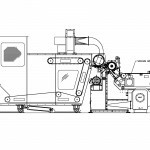 Airlaid machines are capable of handling many types of fiber that cannot be carded effectively including metals, hair, fiberglass, and many types of cellulosic fibers.